Hundreds of members of the Central American migrant caravan move in the early morning hours of Nov. 5, 2018 from Cordoba, Mexico toward their next destination of Puebla. 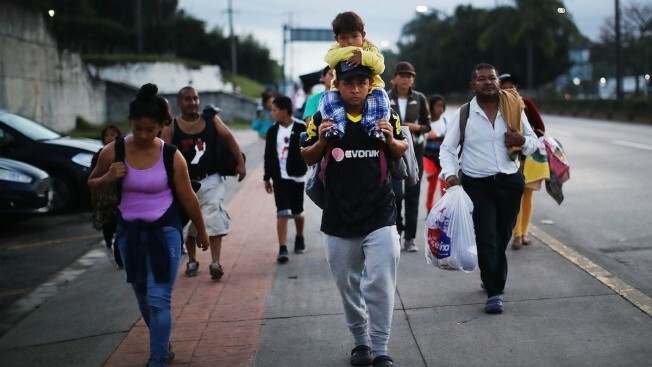 The group of migrants, many of them fleeing violence in their home countries, have not taken a rest day in nearly a week as they travel towards the United States border. As fatigue from the heat, distance and poor sanitary conditions has set in, the numbers of people participating in the march has slowly dwindled but a significant group numbering in the thousands are still determined to get to the United States. When two men with a self-described militia arrived in Columbus, New Mexico, offering help protecting the border from a migrant caravan traveling through Mexico toward the United States, Mayor Esequiel Salas said told them he sees no reason to be fearful. 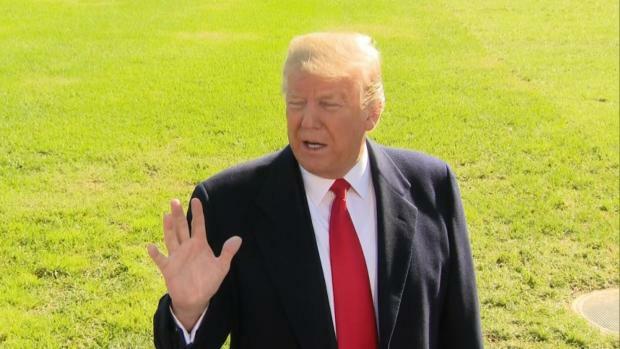 "I told them, 'We have a good relationship with Mexico, with our little sister village Palomas," said Salas, referring to the community just across the border. "A lot of people who never come here, they have a misunderstanding. They hear things that are not true." Jim Peyton, a militia member interviewed by The Albuquerque Journal, said they were in the border town of 1,600 residents scouting locations to prepare for the caravan. The arrival of a small band of men with the Patriots of the Constitution militia left the mayor and other villagers perplexed. But Peyton, from Jasper, Alabama, told the Journal that the militia members' goal is to stop "bad guys" and they're armed only for self-defense. Peyton said he and another militia member checked in with U.S. Customs and Border Protection as soon as they arrived in Columbus, as well as with the mayor. The militia will notify Border Patrol dispatch if they spot illegal crossings or smuggling, Peyton said. "We're here to assist when possible," he said. "We don't have the authority to touch, corral, interfere. That would be illegal because we are not authorized to do so." Militia groups and far-right activists, spurred to action by President Donald Trump's warnings about the threat of an "invasion" of Central America migrants, announced plans last month to head to border to stop the caravan. Exactly how many are en route or will turn out is unclear, and as of Monday, the caravan of about 4,000 people was still some 600 miles and weeks away from reaching the U.S. But the prospect of armed civilians at the border — and the escalating political rhetoric over immigration — have fueled fears of vigilantism at a time when tensions are already running high because of the mail bomb attacks against some of Trump's critics. The U.S. Border Patrol last week warned local landowners in Texas that it expected "possible armed civilians" to come onto their property because of the caravan. 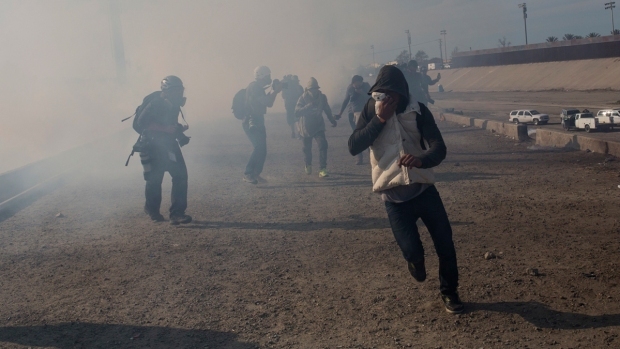 Three activists told The Associated Press that they were going to the border or organizing others, and groups on Facebook have posted dire warnings about the caravan. One said it was "imperative that we have boots on the ground." Another wrote: "WAR! SECURE THE BORDER NOW!" The militia members said they plan to bring guns and equipment such as bulletproof vests and lend a hand to the Border Patrol to protect against people unlawfully entering the country. "They're just laughing in our face," said Shannon McGauley, president of the Texas Minutemen. "It's a free-for-all in America." McGauley said he already has members at three points of the state's border with Mexico and expects to add 25 to 100 more people in the coming days. The Border Patrol's El Paso Sector, which includes the New Mexico portion of the border, said in a statement that the agency was aware of people in the area "with the goal of 'patrolling' the border but they are not working in conjunction with the Border Patrol." The agency said anyone observing the border should report any illegal activity they witness "and allow those enforcement professionals to perform those duties without interfering." Border watch groups and militias have been patrolling the 2,000-mile (3,200-kilometer) southern boundary off and on for more than a decade. Typically, the groups watch for people illegally crossing into the U.S. When they spot crossers, they contact the Border Patrol. Their presence has led to conflict in some cases. A militia member killed two people in 2009 during an invasion of what she thought was a drug house near the border in Arivaca, Arizona. Meanwhile, residents in Arivaca and Columbus alike, have been posting signs in recent weeks warning that militia members are not welcome. "They should not be patrolling the border if they were not sent by the federal government," said Martin Garcia, a Columbus resident, as he watched over farmworkers picking red chile in a field that borders Mexico. "If the U.S. wants to send soldiers, that's fine." 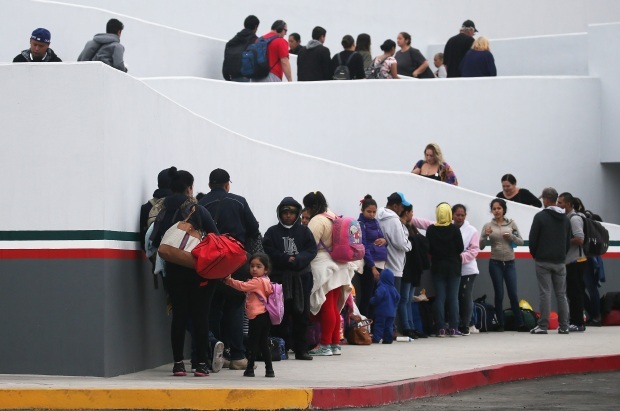 The migrants' northward trek has led to an election-season furor in the U.S., with the Trump administration pledging to dispatch more than 15,000 active-duty troops to Texas, California and Arizona. While their were only about 100 troops at the border as of Friday, another 3,500 troops have been deployed to staging bases along the border, including about 1,000 Marines in California. Critics have called the deployment a political stunt that's shaping up to cost taxpayers about $220 million, according to two U.S. defense officials who were not authorized to speak publicly. Border crossings, while rising this year, are still far below the numbers in previous decades. But Harel Shapira, a University of Texas professor who was embedded with an Arizona militia from 2005 to 2008, said that what's driving militia groups is the way some politicians have more recently defined immigrants as "existential threats to a particular way of life." Monica Marin, an Oregon resident, said she has raised about $4,000 online to help militias buy supplies. She argued that members of the caravan are dangerous, echoing Trump's false claim that "unknown Middle Easterners" are mixed in with the crowd. There is no evidence to support those claims. "I see young, fighting-age men who do not look like they're starving. They look like they're ready to fight," Marin said. At the same time, she said: "We're trained. We're not hotheads. We're not out there to shoot people." Marianna Trevino Wright, a South Texas resident who is director of the nonprofit National Butterfly Center, said she is more fearful of the militias than the caravan. "We go about our business here every day in a peaceful manner," Wright said. "The idea that we could be invaded not by illegal immigrants but by militia groups ... is regrettable, and it will end badly." The Associated Press' Nomaan Merchant and NBC's Danielle Abreu contributed to this report.